Available from booksellers November 3, 2015! Here are some lovely blurbs. 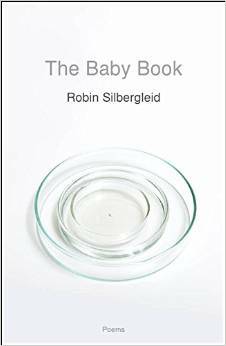 It is impossible to read just one poem from Robin Silbergleid’s new collection The Baby Book. I dare you to try. As Silbergleid’s speaker endures obstacles on the path to parenthood, readers develop an intimacy with the narrative, and an appreciation for how the poet captures surreal elements of clinical scenes and their accompanying vernacular. These poems embrace and reinvent form, and are equally adept in moments of seriousness and dark humor. In “Prayer to the New Virgin Mary,” Silbergleid begins, “Hell is AOL on a bad day, a half-finished message / on the answering machine. The word positive.” With the emotional depth of a novel, and the poignancy of memoir, Silbergleid has created a testament to the human spirit, and a poetry collection that is truly unforgettable. –Linda Layne, author of Motherhood Lost: A Feminist Account of Pregnancy Loss in America and producer of Motherhood Lost: Conversations. A first review, from Susan Jett.